Highway 93 (also known as the Banff—Windermere Road) branches west from the TransCanada Highway at Castle Mountain Junction, 29 kilometers (18 miles) northwest of Banff and 27 kilometers (16.8 miles) southeast of Lake Louise. From this point, Highway 93 climbs steadily for six kilometers (3.7 miles) to the Continental Divide, crossing it at an elevation of 1,640 meters (5,650 feet). The divide marks the border between Kootenay National Park to the west and Banff National Park to the east. Immediately west of the divide is the Vermilion Pass Burn. Lightning started the fire that roared through this area in 1968, destroying thousands of hectares of trees. Lodgepole pine, which requires the heat of a fire to release its seeds, was the first plant species to sprout up through the charred ground. More than 40 years later, effects of the devastating fire are still obvious. Along the short Fireweed Trail you’ll see the growth of a new forest on the floor of the old. Storm Mountain (3,161 meters/10,370 feet) is the distinctive peak to the east. Beyond the Vermilion Pass Burn pullout, the devastation caused by a more recent fire (2003) becomes apparent. Also started by lightning, it began as a number of fires, which came together to cross the highway, burn entire watersheds, and extend high up the surrounding mountains to the extent of the tree line. Be sure to stop and take the enjoyable self-guided trail, one kilometer (0.6 mile) each way, which leads along this ice-carved, marble-streaked canyon and through the remains of a forest destroyed by wildfires in 2003. The walk takes only about 30 minutes or so, yet as one of several interpretive plaques says, it takes you back more than 500 million years. 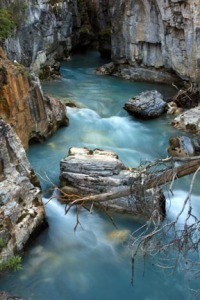 From the parking lot, the trail follows a fault in the limestone and marble bedrock through Marble Canyon, which has been eroded to depths of 37 meters (130 feet) by fast-flowing Tokumm Creek. As the canyon narrows, water roars down through it in a series of falls. The trail ends at a splendid viewpoint where a natural rock arch spans a gorge. Marble Canyon is also the trailhead for the Kaufmann Lake Trail. A scenic one-kilometer (0.6-mile) trail (20 minutes each way) leads over a new (2014) bridge across the Vermilion River to this unique natural wonder: three circular ponds stained red, orange, and mustard yellow by oxide-bearing springs. The natives, who believed that animal spirits resided in these springs, collected ocher from around the pools. They mixed it with animal fat or fish oil and then used it in ceremonial body and rock painting. The ocher had a spiritual association and was used in important rituals. Europeans, seeing an opportunity to “add to the growing economy of the nation,” mined the ocher in the early 1900s and shipped it to paint manufacturers in Calgary. From the Paint Pots, the highway parallels the glacial-fed Vermilion River for 30 kilometers (19 miles). The first worthwhile stop is Numa Falls, where the Vermilion River tumbles over exposed bedrock. Continuing downstream, extensive devastation along the southwestern flanks of Mount Shanks is the result of fire started by lightning strike. The fire destroyed more than 4,000 hectares (9,884 acres) of forest over a two-month period starting in July 2001. Vermilion Crossing holds the only commercialism in the heart of the park, but compared to neighboring Banff, the development is minuscule. 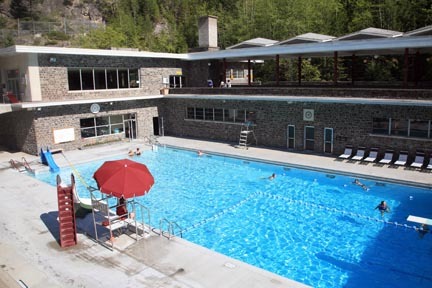 Here you’ll find the Kootenay Park Lodge complex, which includes cabin accommodations, a restaurant, a general store, and an official park information center (open mid-May to mid-October). Across the road from the lodge is a riverside picnic area. Continuing south, the highway passes two signposted mineral licks (watch for bighorn sheep, mountain goats, and moose), then climbs to a viewpoint for Hector Gorge. A pleasant picnic area along this stretch of highway is beside Wardle Creek. As you continue to climb from the Vermilion River and pass small, green Kootenay Pond, your eyes will revel in views of milky green rivers, lush grassy meadows, tree-covered hills, and craggy, snowcapped peaks; keep your eyes peeled for mountain goats. The highway then descends to cross the Kootenay River at Kootenay Crossing. This was where the official ribbon-cutting ceremony opening the Banff—Windermere Road took place in 1923. Today you’ll find a roadside historical exhibit, hiking trails, and a warden’s station. The following stretch of highway passes through an area of high wildlife concentration. Black bears, elk, deer, moose, coyotes, and, in winter, wolves are all regular visitors to cleared areas along the highway. After passing McLeod Meadows Campground and a riverside picnic area inhabited by a healthy population of chirpy Columbian ground squirrels, Highway 93 climbs to a pullout that affords panoramic views of the entire valley and across to the Mitchell and Vermilion ranges. Beyond the Kootenay Valley viewpoint, Highway 93 tops out at 1,486 meters (4,875 feet) atop Sinclair Pass. Just beyond the pass, tiny Olive Lake is worth a stop. With outlets that flow in opposite directions and into two different watersheds, the lake is geologically interesting, but for the younger set, spotting brook trout from the viewing platform will prove more attention-grabbing. From Olive Lake, it’s a steep 12-kilometer (7.5-mile) descent along Sinclair Creek to the park’s western boundary and the town of Radium Hot Springs. Just after the halfway point is the only road tunnel in the Canadian Rockies. After you emerge from the tunnel, a parking lot on the south side of the road provides the perfect viewing point for sheer red cliffs that form the high point of the Redwall Fault. Through this fracture in the Earth’s crust, mineral springs have been bubbling to the surface for thousands of years, staining the surface with red-colored iron oxide. This soothing attraction (250/347-9485, 9 a.m. to 11 p.m. daily in summer, noon to 9 p.m. daily the rest of the year) lies inside the park but just three kilometers (1.9 miles) northeast of the town of the same name, which is outside the park boundary. It was discovered many centuries ago by the Kootenay people, who, like today’s visitors, came to enjoy the odorless mineral water that gushes out of the Redwall Fault at 44°C (111°F). Englishman Roland Stuart purchased the springs for $160 in 1890 and built rough concrete pools to contain the water. Development continued when a visiting millionaire–impressed by the improvement in his paralysis after soaking in the springs–contributed more money to the project. Originally known as Sinclair Hot Springs, after an early settler, the springs’ name was changed to Radium in 1915 for the high level of radioactivity in the water. With the declaration of Kootenay National Park in 1922, ownership reverted to the government. Today the water is diverted from its natural course into the commercial pools, including one that is Canada’s largest. Steep cliffs tower directly above the hot pool, whose waters are colored a milky blue by dissolved salts, which include calcium bicarbonate and sulfates of calcium, magnesium, and sodium. The hot pool (39°C/97°F) is particularly stimulating in winter, when it’s edged by snow and covered in steam—your head is almost cold in the chill air, but your submerged body melts into oblivion. Admission is adult $7.00 (or swim all day for $10), senior and child $5.75 (day pass $9.55). Towel and locker rentals are available, as are spa services. If you’re camping at the park’s Redstreak Campground, you can reach the complex on foot. From the hot springs, Highway 93 passes through narrow Sinclair Canyon, descending quickly to the town of Radium Hot Springs. The canyon was eroded by the fast-flowing waters of Sinclair Creek, but not enough for a two-lane highway. But that was nothing a stick of dynamite couldn’t fix. In addition to artificially widening the canyon, road builders constructed the highway over the top of the creek where it flows through the narrow gap. Small parking lots above and below the canyon provide an opportunity to pull over and walk through the canyon.